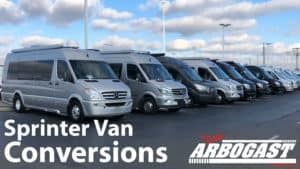 Browse the great selection of Sprinter Van Conversion models from the top manufacturers at Dave Arbogast! Mercedes-Benz Master Upfitter, Midwest Automotive Designs has specialized in Sprinter Van Conversions for nearly 20 years! Midwest Automotive manufactures a variety of Sprinter Van Conversion models, from Class B Motorhomes to Custom Luxury Sprinter Vans. Sprinter Van Conversions are available in 2 roof heights, 3 wheelbase lengths, and virtually any paint color! Best of all, Dave Arbogast works exclusively with Midwest Automotive to accommodate any custom needs you may have! If you have any questions, or are unable to find what you are looking for, please don’t hesitate to call us at 888.436.3216 or contact us today!